Info "This time my target is the banana! Destroy all the bananas!" I Hate Bananas is one of Dribble and Spitz's microgames in WarioWare: Twisted! 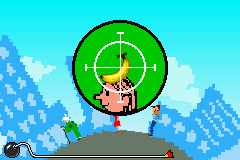 The game's purpose is to shoot a banana on a person's head. To do so, the player has to aim it with tilting the Game Boy Advance and press the A button to shoot. If this occurs, the game is won. However, if time is up and the banana is not hit the player will lose. 1st level difficulty: There will be three people (only one of them has the banana). 2nd level difficulty: There will be four people. 3rd level difficulty: There will be four walking people. This page was last edited on November 16, 2018, at 21:55.